Thomas Gallaudet (1822-1902) and Henry Winter Syle (1846-1890) were pioneers in the education and inclusion of the deaf in the life of The Episcopal Church. 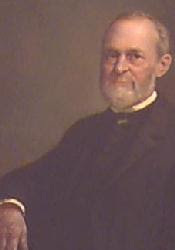 Galladet, born in Connecticut, followed in his father’s footsteps as an educator of the hearing impaired. Thomas (in the color image) was not deaf, but his wife, Elizabeth was deaf. He was ordained in The Episcopal Church, and established St. Ann’s Church in New York with worship services primarily in sign language. 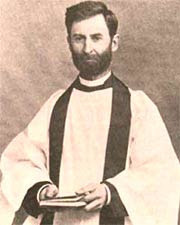 One of Gallaudet’s students, Henry Winter Syle (black and white photograph) became the first deaf person ordained an Episcopal priest. Syle, born in China, educated in Gallaudet’s school, was encouraged by Gallaudet to seek ordination. Syle went on to establish his own congregation for the deaf. The work and witness of Gallaudet and Syle are great reminders that our church has long sought to include all of God’s children at the Holy Table. We follow giant footsteps as we continue their work.